There are many families in which grandparents may play a role in raising the children. In some cases, especially if one or both parents are out of the picture, grandparents may seek visitation (‘grandparenting time,’ so to speak) with the kids. This is sometimes possible, but sometimes not – either way, certain criteria must be met in order for that request to be granted without infringing on the parental rights of whichever parent or guardian is still in the children’s lives. In Georgia, there are two ways to seek visitation for grandparents. 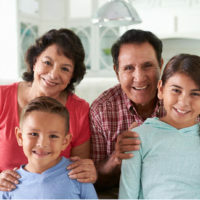 They may file their own petition to seek visitation, or they can join in any existing action that is dealing with visitation or other child custody issues – for example, if one spouse has an action going to terminate the other’s parental rights, the grandparents may be able to join and petition to be awarded visitation. It is important to keep in mind that neither of these two ways can be used if the child lives with both parents (who both retain their parental rights), and those parents have not separated. The state favors two-parent homes and generally sees no reason to break them up. Regardless of which way grandparents may choose to file their petition, what usually happens next is that the court will either hold a hearing or send the parties to mediation to work out whether visitation is appropriate and possible. Depending on how volatile the situation is, a guardian ad litem may be appointed to oversee your child’s rights in the matter, and if this does occur, it is imperative that you not misunderstand their role. A guardian ad litem works for your child and only your child – they have no obligation to share anything with you, only with the court. The standard that must be met for visitation to be granted can be quite high, because Georgia, like most states, tends to presume that the best interests of a child are served by the choices their parents make for them. Generally, visitation will be awarded if the court decides that not doing so would be harmful to the child, and accordingly, that awarding it would be in the child’s best interests. This does not sound stringent, but it is, because multiple factors are assessed in determining exactly what the best interests of the child are. Georgia law holds that the best interests of the child can only be arrived at upon contemplation of factors that take all aspects of the child’s life into account – the mental, physical and emotional must all be weighed. Examples include the ability of the child to feel physically and emotionally safe with either parent, the relationship between the child and both parents and any siblings, the community ties they may enjoy, any past history of violence on the part of the child or either parent, and many others. If it is deemed to be a positive influence on the child to allow their grandparents visitation, it will be taken into account. The relationship between grandparents and their grandchildren is something to fight for. If you want to seek visitation with your grandchildren, however, it is a good idea to consult an attorney to make sure the law is on your side. The Atlanta child custody attorneys at Buckhead Family Law can sit down with you and try to help answer any questions. Contact us today to schedule an appointment.